As usual, when the long summer days arrive it’s a challenge to sit down and read or write because I only want to be outdoors. When I finally go indoors around 9:00 p.m. and get other essentials done it’s time for bed… after a relaxing Netflix movie, or course. With this uncomfortably hot and worrisome drought we’ve been having, the only time it’s cool enough to be outside is early morning and in the evenings after 7:00. 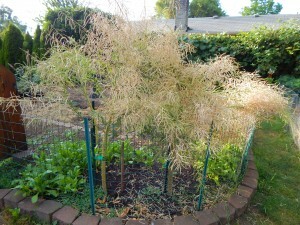 Never-the-less, despite time limitations and lack of motivation, I wanted to get up this post about saving kale seed since I recently pulled up the dinosaur and curly leaf kale that overwintered this year and went to seed. Kale is such an easy seed to save, and it doesn’t have any problem reseeding itself if you leave it in the ground too long, which is what I did and I got hundreds of small kale shoots coming up that I had to pull out since they were competing with my freshly sown sunflowers and cosmos out near the back arbor. 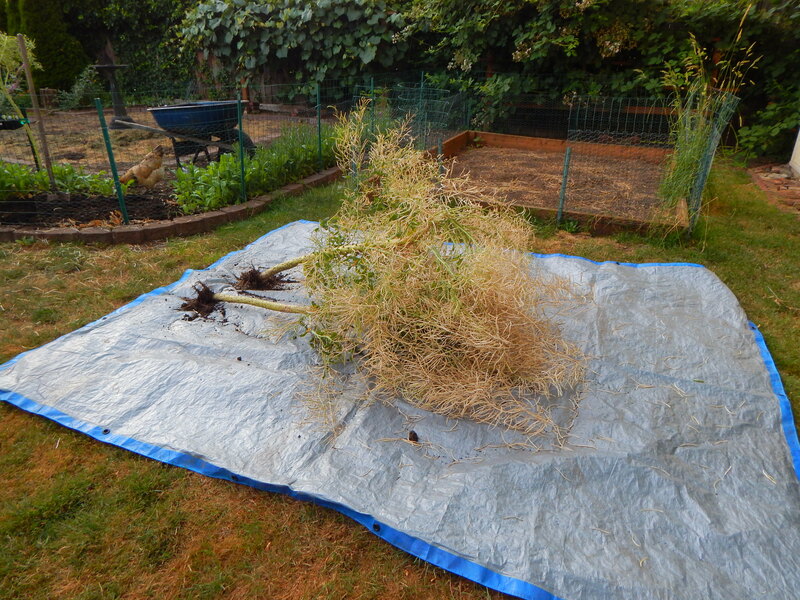 When the kale pods have turned yellow and are dry, pull out the bush and lay it out on a tarp. Cut off all the stems into the tarp with the gazillions of pods and sweep off the dirt. 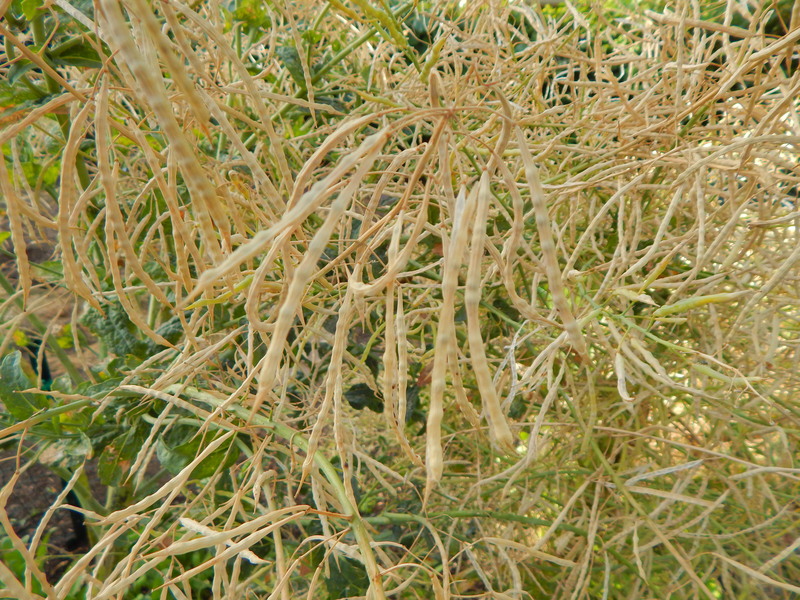 When that is done, threshing and pounding on the stems and pods will release the seeds. 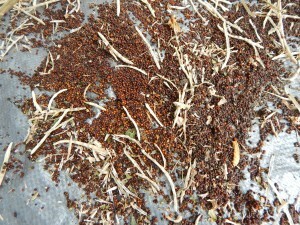 Scoop up the seeds and filter out the debris. You can use any kind of screen or even a colander with really small holes to filter out the pods and debris. 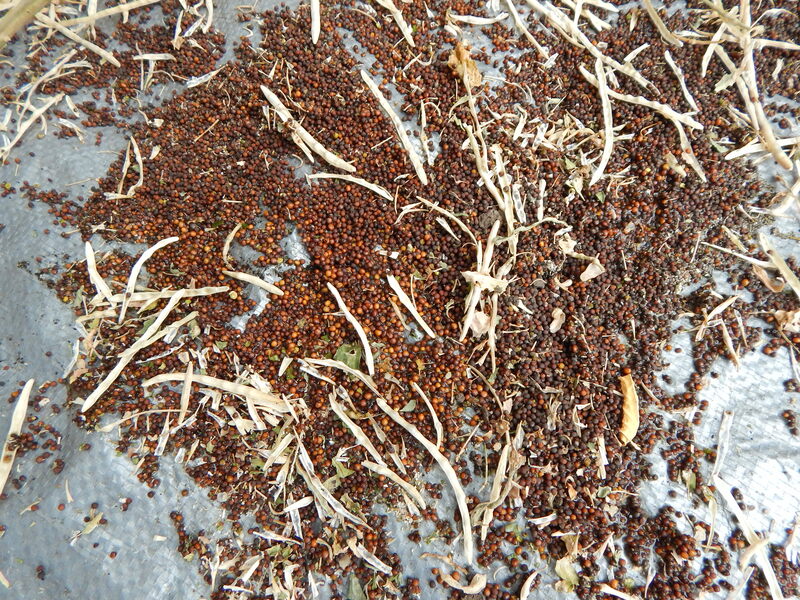 I usually just pour the seeds and debris into the sill and shake it into a bowl. It’s not important to remove every single bit of debris for home use. 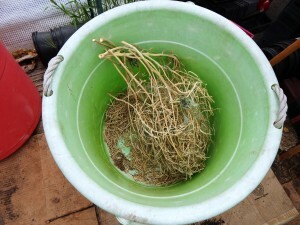 Another method that is really easy is to cut off the stems and place them into a big bucket. Beat them around and the seeds will easily release from the pods and stay nice and contained. I love these big garden buckets in the last photo. I’ve used them forever. Some last several years while others are not of the best quality and can break after barely a year’s use. It’s not good that they end up in the landfill eventually, but what to do? Maybe patch them up with Super Mend to extend their life? 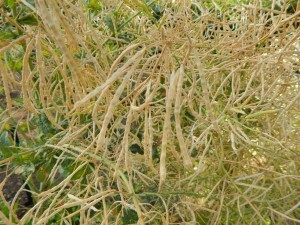 This same method can apply to all kinds of vegetables and flowers that produce seeds in pods. Other kinds of seeds like chard, have to be picked of the stems. 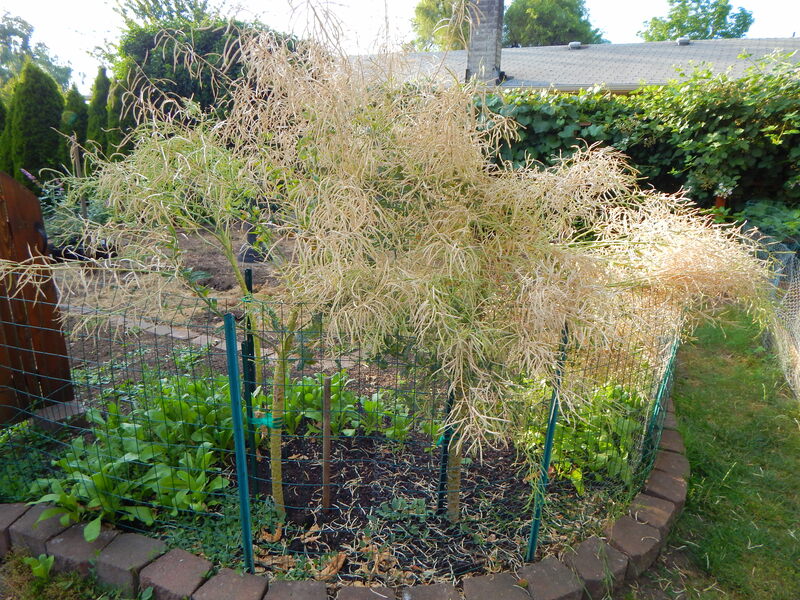 Now I have all this seed and will probably sow a little curly leaf kale in some far corner of the garden where I’m not letting the beds go fallow, then I can harvest it later during the fall and winter. The only kale I really like that has a more neutral flavor and goes well in soups and stir fries is the green curly leaf. I’ve learned that the Russian kale is too bitter and tough, and the dinosaur kale is also too tough and pungent for my pallet. The curly leaf really suits me, and considering how expensive organic kale is in at the grocery store, it is one vegetable I will grow myself this year if I can find a spot. I don’t know if anyone is noticing, but inflation is driving up food prices big time right now, not to mention the drought in California and elsewhere that is driving up costs for produce. All the more reason to have your own garden and grow your own vegetables and fruit.